Summary: All banks are trying to fine-tune the onboarding process. We provide some creative ideas from community banks. For parents worried about teen depression, new research from Stony Brook University may help provide some answers. It finds that despite popular belief that smartphones and video games lead to social isolation and ultimately depression, something else may be a bigger contributor. Researchers found that the more time teens spent online (screen time) in any shape, the greater the risk of reporting depressive symptoms. 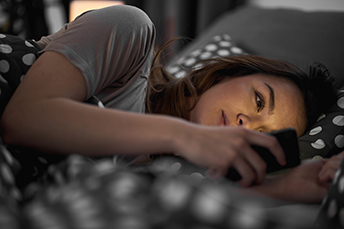 They found teens with the most screen time also got the least amount of sleep or reported insomnia, which ramped up feelings of depression. It seems parents are right in asking kids to unplug an hour before bed time and limiting overall usage of digital devices. As teenagers unplug more, it is a good thing, as they may actually connect more too, given the extra time. In banking, more connections mean greater customer engagements and possibly a more memorable and effective onboarding process. To help you fine-tune your onboarding approach, here are some ideas from other community banks. Several banks we know are getting more strategic with their onboarding, actively managing the customer experience over the first 90 days of opening any new account. Then, those results are measured against clear metrics to see how to keep improving. The key to success is using predictive analytics from the beginning to discern the needs and preferences of each customer, and segment onboarding messages accordingly. A number of banks are also using multiple channels to onboard in some pretty creative ways. One bank based in the Northeast develops personalized welcome videos that customers can watch on their mobile devices. A Midwestern bank sends a welcome email that not only lists account features, but also a "What's Next?" button. When that button is clicked, it sends new customers to web pages that offer suggestions on how to better use their account and use ancillary services. This is a great way to lead your new account openers to other valuable offerings your bank may have. Other options to consider for these communications include: a welcome letter with a checklist of things to expect or do; a simple thank you email with the appropriate links to guide them through your bank; or even a direct mail communication that provides the customer with a recap of the benefits of their account and other services available. Sending at least one follow up communication is the minimum that a bank should do these days while onboarding customers, but many are doing much more. By developing onboarding communications schedules, you can maximize opportunities to better serve your customers. While the exact cadence of communications may take some discussion with your relationship managers and marketing team, a good place to start is to plan approximately 5 to 7 within the first 90 days of the relationship. You may also want to vary the channels of communication to test the effectiveness of each one. By sharing additional noteworthy account features, providing information for related products, and asking for customer service feedback, your team can better engage with new customers. This will not only provide these customers with additional information, but also tell you early on in the process specifically what they need, while making them feel more valued. That should help you sleep well at night. Payments company Square said it has received approval for a virtual currency license from the New York State Department of Financial Services. Square also holds a money-transmitter license from the regulator. 1) Minnwest Bank ($1.7B, MN) will acquire First State Bank ($50mm, SD) and Peoples State Bank ($72mm, SD) for an undisclosed sum. 2) Carolina Trust Bank ($447mm, NC) will acquire Clover Community Bank ($130mm, SC) for $21.5mm in cash (20%) and stock (80%) or about 1.63x tangible book. 3) Midwest Bank ($687mm, NE) will acquire Redstone Bank ($118mm, CO) for an undisclosed sum. 4) Hometown Bank ($296mm, WI) will acquire United Community Bank ($179mm, WI) for an undisclosed price. 5) BOKF ($33B, OK) will acquire CoBiz Bank ($3.8B, CO) for about $977mm in cash (25%) and stock (75%) or about 2.9x tangible book. 6) Jackson County Bank ($535mm, IN) will acquire investment advisory company Krumme and Brock Investment Services (IN) for an undisclosed sum. 7) People's United Bank ($44B, CT) will acquire Farmington Bank ($3.1B, CT) for $544mm in stock (100%) or about 1.87x tangible book. 8) SB One Bank ($1.4B, NJ) will acquire Enterprise Bank ($244mm, NJ) for $48.2mm in stock (100%). Bank of Canada's senior researcher said blockchain does not currently have the cost-savings expected compared to a central banking system and still has the vulnerabilities of hacking and operational risks.